What? 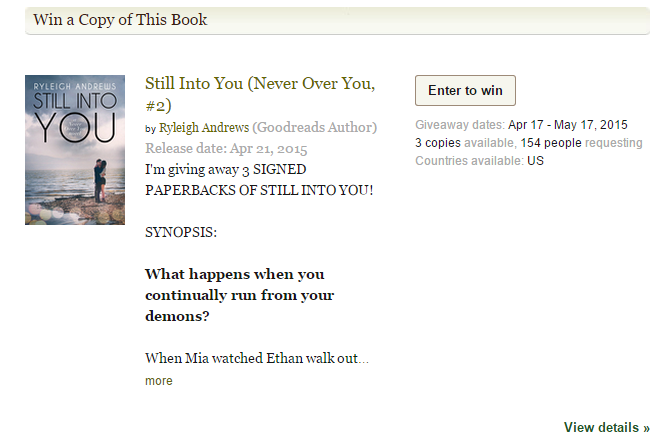 A giveaway for a signed Still Into You paperback? Enter to win one of three signed copies of Still Into You over on my Goodreads site. I also have a few other ways you can get paperbacks of my books. 1) You can always order it from Amazon, but it won’t be signed. (Only Bring Me You is available as a paperback on Amazon … for now, but Still Into You will be up there within a couple of days). 2) If you want to purchase your very own personally signed paperback of Bring Me You or Still Into You, you can do that on my website here … just click on the Signed Paperbacks tab. Still Into You is LIVE!